This book presents a set of contributions to the current flow of psycholinguistic research, with new and challenging data gathered from Spanish that may illuminate issues about the generality of language processing models. Although it is possible to find a considerable amount of papers on psycholinguistic research with the Spanish language published in English-speaking journals, unfortunately, the scientific community does not have access to an overview of psycholinguistics in Spain. This book overcomes these limitations because it brings together state-of-the-art descriptions of the research and theory of the different subareas of psycholinguistics currently being studied in Spain. Spanish, the third most widely-used language in the world, differs from English in a number of important respects. Since English has been predominant in psycholinguistic research, contrasting properties of Spanish may help to test the generality of language processing mechanisms and to refine their description. The set of contrasting features considered in this book includes acoustical and syllabic transparency, shallow orthography, a much richer morphology, flexibility in word order, less variability in intonational contours, and the existence of null pronominal subjects for inflected verbs. There are also interesting contrasts in the frequency of different linguistic units, whose impact on language processing is also evaluated. One of the main lines of argument throughout this book deals with the tension between universality and variation as a way of characterizing the functioning of language capacities and processes. The variety of topics covered by this book ranges from one end of the spectrum of language related behavior to the other: speech perception, lexical access in word recognition, relations between phonological and orthographic representations, sentence processing, discourse comprehension, and language production. All chapters focus on questions of general interest within each topic, and in most cases they appeal to one particular feature of the Spanish language that is relevant for a given question. Most chapters show the indisputable importance of crosslinguistic research in psycholinguistics to improve understanding on whether universal cognitive mechanisms and language specific routines underlie the ability of understanding and producing language. Contents: Preface. N. Sebastián-Gallés, Speech Perception in Catalan and Spanish. R.M. Sánchez-Casas, Lexical Access in Visual Word Recognition: The Contribution of Word Form. J.J. Cañas, M.T. Bajo, Automatic and Strategic Processes in Lexical Access. F. Valle-Arroyo, Dual-Route Models in Spanish: Developmental and Neuropsychological Data. J. Alegría, On the Origin of Phonological Representations in Deaf People. F. Cuetos, D.C. Mitchell, M.M.B. Corley, Parsing in Different Languages. E. Gilboy, J.M. Sopena, Segmentation Effects in the Processing of Complex Noun Pronouns With Relative Clauses. J.E. García-Albea, S. Meltzer, Processing Empty Categories in Spanish. M. Carreiras, A. Graham, J. Oakhill, Understanding Anaphora: The Role of Superficial and Conceptual Information. M. de Vega, Spatial and Interpersonal Models in the Comprehension of Narratives. J.M. Igoa, The Relationship Between Conceptualization and Formulation Processes in Sentence Production: Some Evidence from Spanish. 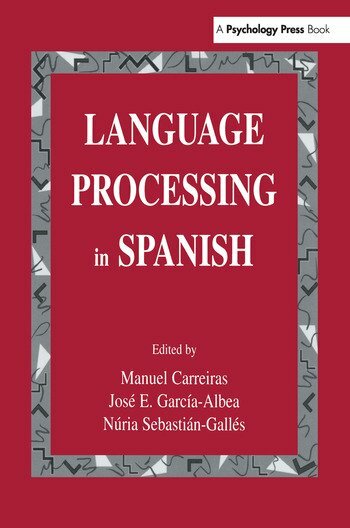 "This book is a first attempt to bring together a collection of state-of-the-art studies of various lines of research on language processing in Spanish, ranging from speech perception to sentence production."